So whether it's a wall mounted or freestanding model you're looking for, we have it. 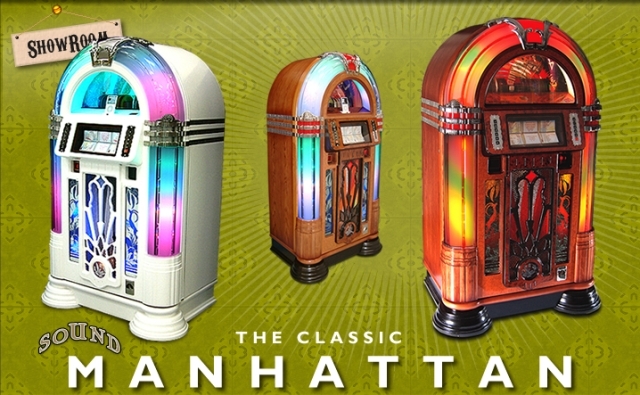 all are supplied with your choice of CD's with PPL licence included in rental prices. 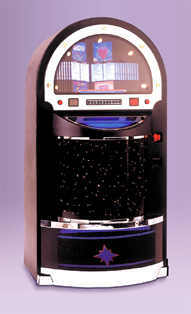 (Rental models only)Obviously a site visit is essential with a jukebox to supply the optimum system for your site. 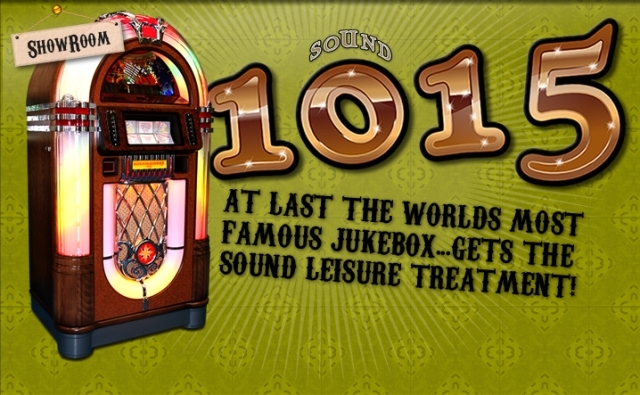 Introducing Sound Leisure's Gazelle Dome topped classic Jukebox. 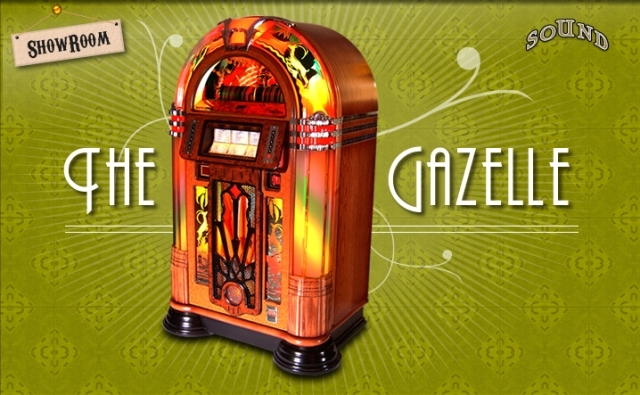 Striking colours and an undeniable Art Deco influence make the Gazelle truly distinctive in it’s appearance. The vivid reds and greens of the dome graphics depict stylised gazelles leaping across the dome with a second pair etched into the mirrored glass door panels. 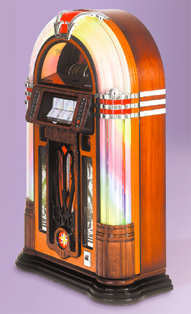 This is a reproduction of the "wurlitzer bubbler".This model has full length bubble tubes which extend right to the top of the dome.Made by the leading british jukebox maufacturer. 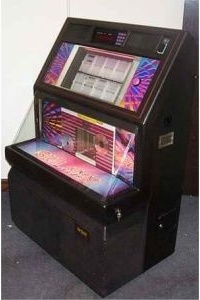 Offers 80 CD capacity ,but only 70 title display cards can be shown on the jukebox - a cd choice file is also included.Watch the cd being played on one of the simplest mechanisms in the world, enhancing its reliability.All features as gazelle model above.This item is available to order with approximately 2 weeks lead time. It will be delivered diect from the manufacturer and set up in your location. (not including extra speakers which can be added to extend your listening pleasure).Comes complete with hand held remote control. Supplied with a 1 year full manufacturer warranty. Comes complete with hand held remote control. Holds 100 of your favourite cds.Flip over title cards shown 10 at a time.Nicely moulded front glass and sloping front (lit) visible easy to load cd mechanism. Wall mounted 50 cd player.fully integrated apart from speakers. Features rotating title display cards. 500 watt amp. So nice its in my house! 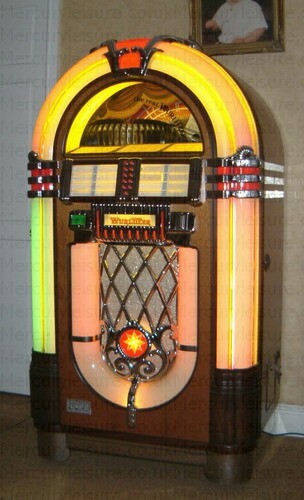 Vinyl 45s player. £3395 (supplied full of 45s) sorry. sold!